If you are thinking about Irish potatoes, then these are shrubby and edible vegetable which were first introduced in the market by European explorers. Every single part of the plant is toxic if eaten raw, but you can gain incredible health benefits if the potatoes are properly harvested. Due to its cream colored skin, these potatoes may be nicknamed as ‘white potatoes’. But, the actual name comes from the fact that these were cultivated in Ireland way back in the 1800s. They also take you back to the great Irish famine, the worst disaster in history. When it comes to defining the shape, these are not only oblong in nature but also waxy to touch. Under the varieties of white potatoes, you would come across Superior, Atlantic, Cascade, Snowden, White Elephant, White Rose, Cal White and Kennebec. 3 How to Make Irish Potatoes Recipes? 3.4.1 Was this article helpful? 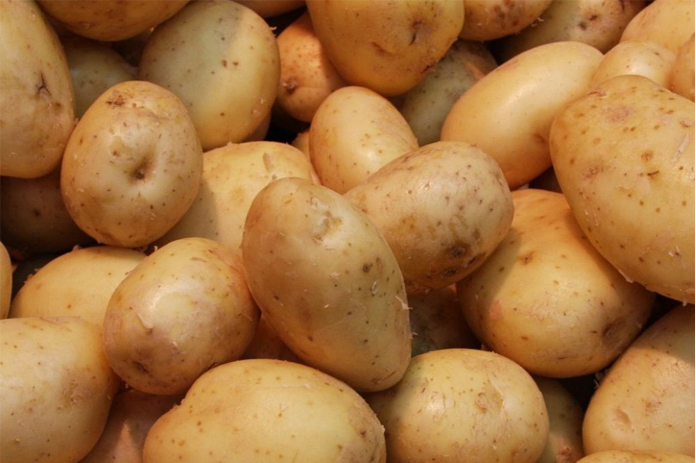 Irish potatoes are a rich source of minerals and nutrients. In 100 grams of potatoes, the sugar content is as less as 0.8 grams, and the fat is as low as 0.1 grams. While the calorie intake is 76 kcal, Vitamin C is 19.7 mg as compared to the Vitamin B5 and B6. The vegetable also contains phosphorous and potassium as much as 57mg and 421mg respectively. On the whole, 100 grams of the vegetable constitutes protein as high as 2 grams and calcium weighing 12 mg. The vegetable also has Zinc, Magnesium and Manganese present in a few milligrams. If you go through the Irish potatoes nutritional facts, then carbohydrates is predominantly present in form of starch. Being a rich source of Vitamin B6, Irish potatoes help in maintaining the nervous system and a balanced state of mind. The essential vitamin is used in making neurotransmitters which is quite important for regulating the mood. The person can expect to keep his mind relaxed because the vitamin helps in producing adrenaline and GABA. Weak individuals should always eat Irish potatoes because it contains carbohydrates and sufficient amount of proteins. Moreover, other constituents like Vitamin C and B-complex helps in increasing body weight by absorbing carbohydrates. Since potatoes primarily contain carbohydrates, these are easier to digest. In fact, mashed potatoes are fed to infants who are still nibbling on semi-solid food and are seeking to gain energy. But, the person should always set a limit while he is eating potatoes. This is because excess consumption can lead to acidity in the long run. Moreover, a considerable amount of fiber can also contribute towards digestion in case the person is eating cold and raw potatoes. Vitamin C present in Irish potatoes can help to fight back diseases like scurvy. As the immune system is strengthened, the vegetable keeps the person away from viral infection and the probability of suffering from cold. Regular consumption can heal cracked lips and bleeding gums. Irish potatoes can always benefit aged people. Water strained from potatoes gives instant relief from rheumatism and arthritis. But, since the vegetable is supposed to gain weight, it may have an adverse effect on people who have swelling and pain around the joints. The person would be able to overcome high blood pressure if he eats Irish potatoes frequently. The fibers also keep the cholesterol level to an optimal level while the functioning of the liver is considerably improved. Besides, diabetic patients can benefit from such potatoes because sufficient insulin helps in regulating the sugar level. The carbohydrates present in the vegetable aids to reduce fatigue and in keeping the brain alert and active. Additionally, phosphorous and zinc adds on to the overall development of the brain. The individual may not have to worry about heart ailments as the organ remains healthy due to carotenoids, zeaxanthin and lutein. Kidney stones are developed due to excess uric acid in the blood. But, enjoying an Irish potato recipe can actually curb calcium deposition in the kidneys. So, if you have kidney stones, then it’s always a good idea to include Irish potatoes in your diet. How to Make Irish Potatoes Recipes? There are many kinds of recipes you can think with Irish potatoes. You can either cook Irish potato Galette, Irish potato bread or potato and spring onion soup. Let’s have a look at the procedure one by one. 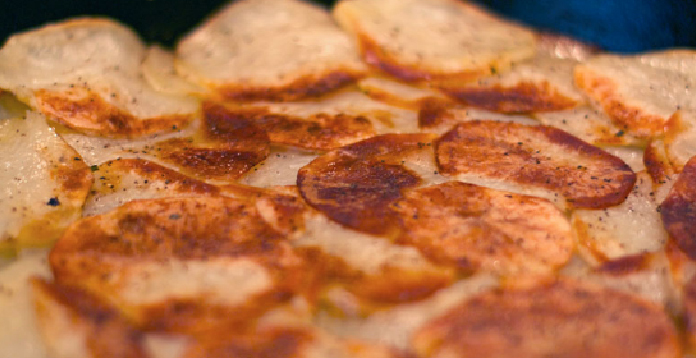 For preparing galette, you first need to peel and slice the potatoes. Later, you should melt butter on a pan and arrange the slices evenly overlapping each other. Once you have heated the pan for 35 minutes, you should wait till the slices turn golden brown. Soon after switching off the gas burner, you should keep the gallete on the plate and enjoy it with tomato sauce. For such a kind of soup, you first need to chop spring onions in the crosswise direction. Make sure you set aside the white parts and the chopped shoots before moving on with the next step. Afterwards, you need to heat potato slices along with chopped onions for at least 8 to 10 minutes. Once the vegetables become soft, you need to transfer them into a vessel and prepare a puree with a blender. Continue blending till a thick paste is formed. 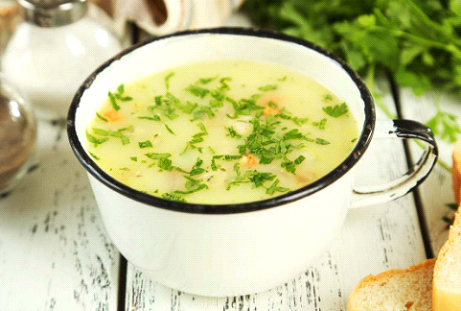 Finally, you should garnish the soup and add seasonings as per you preferences. If you are thinking about a different recipe for Irish potatoes, then think about Irish potato bread. Combining flour, bacon fat, and mashed potatoes should be the first step. Soon after you have prepared a smooth dough, you should roll and make small squares. Later, you should bake the bread for 20 minutes, heat bacon fat and cook bread till it becomes warm. After flipping the bread once for two minutes, the snack is ready and can be served with spring onions. Once you have placed potato slices on a pan, you need to cover them with water. Later, you should boil the chunks, and simmer them for a few minutes till they become soft and tender. Soon after you have placed the slices in a bowl, you need to season it with salt, pepper and coriander leaves. Hope you enjoy Irish potatoes no matter what might be the day or occasion. With incredible Irish potato benefits, you would surely never resist eating the vegetable.